The email app on your webOS smartphone does not offer you a lot of options on how to customize it to your liking, with your only options available are to set your notification sound, set an email signature or reply-to address, adjust your sync and retention timeframe, or choose your default mail folders. However, thanks to the webOS homebrew community you now have some additional ways to adjust your email app experience. Homebrew developers Momouton and anseld1986 have released the Email Mega Mix as a Tweaks-enabled patch that took many of the best email-related patches available and then improved on it even further. 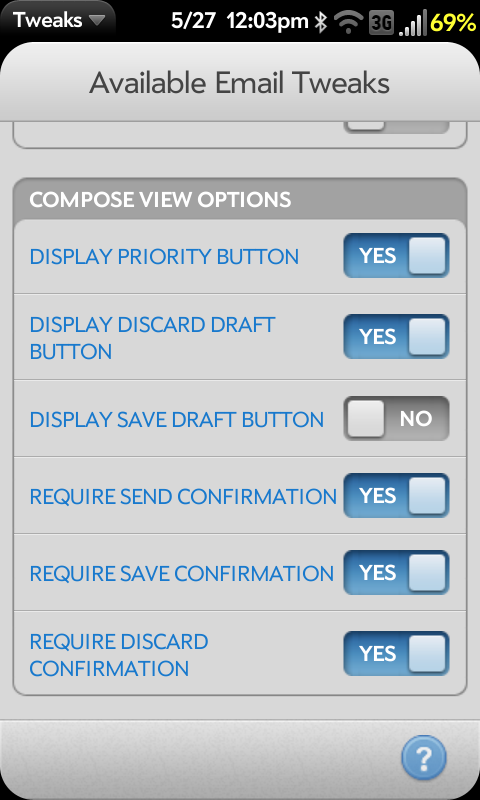 Require Save Confirmation: Used in conjunction with the "Display Save Draft Button" above, you can add a confirmation pop-up asking if you would like to save the draft. Require Discard Confirmation: Used in conjunction with the "Display Discard Draft Button" above, you can add a confirmation pop-up asking if you would like to discard the email when you tap the trash button. Once you toggle any of these tweaks, you will need to close and then re-open the Email app for them to take effect. There is no need to restart the whole phone.